Visiting author Benjamin Hartley is pictured Monday, April 1, taking notes while researching former Upper Iowa University student and 1946 Nobel Peace Prize winner John Mott at Henderson-Wilder Library. 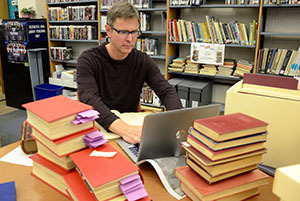 Benjamin Hartley, associate professor of Christian mission from George Fox University in Newberg, Oregon, is currently researching former Upper Iowa University student and 1946 Nobel Peace Prize winner John Mott at UIU’s Henderson-Wilder Library. Hartley is writing a book that focuses on Mott’s contributions to non-Western countries. Hartley has conducted research on Mott in other libraries, such as the Yale Divinity School Library where Mott’s papers are stored. During his recent visit to Henderson-Wilder and the University Archives, the researcher discovered information about Mott’s academic performance at UIU. John Mott was born in Livingston Manor, New York, in 1865, and moved to Postville, Iowa, with his family that same year. At age 16, he enrolled at Upper Iowa University where he studied history and literature before transferring to Cornell University in 1885. Mott was a famous organizer of the Christian movement in the early 20th century.